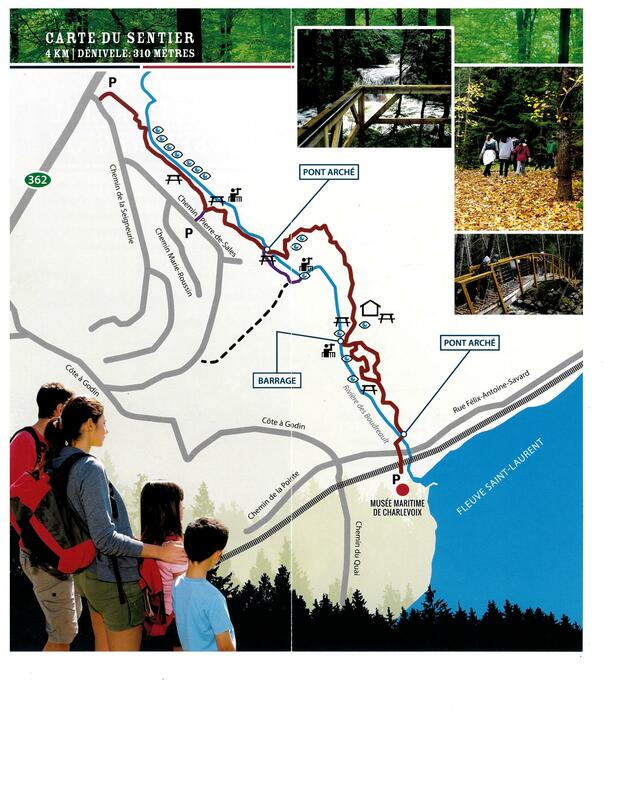 The Sentier de la Forêt marine trail begins at the Papeterie Saint-Gilles, near the Musée maritime de Charlevoix, and leads to a marine forest located in the bioclimatic domain of balsam fir-yellow birch. Following the 1663 earthquake, a landslide radically altered the topography of the site. The trail leads to many views of the river, Isle-aux-Coudres and the South Shore. It meanders near the Boudreault river which, in some spots, is deeply incised in a canyon. From Baie-Saint-Paul, take Route 362 East for approximately 16 km and turn right on the Route du Port. In the municipality of Saint-Joseph-de-la-Rive, turn left on de l’Église Street. The trail begins at the Musée maritime de Charlevoix, 305 de l’Église Street.